The baseball roller coaster has completed its long, slow off-season climb and the fun is just beginning. All of the standings and leaderboards are reset to zero when the teams head north. Of course, they have already been playing baseball for quite a while. We have arbitrarily decided that games in April matter more than the ones in March and so this is the time of year that we start counting wins, losses, and so many more statistics. Spring training games did in fact happen though, whether or not we care about them. Baseball players played baseball. Statistics were compiled. Most games even had a winner and a loser. One month from now, we’ll be making conclusions (however premature) about which teams are surprisingly good or bad, and which players are breaking out or washing out. Why can’t we make any conclusions from the month of baseball that has already been played? Six players hit at least seven HR in spring training. It isn’t surprising that Bryce Harper was one of them. It should be at least a little surprising that the others were Greg Bird, Jesus Aguilar, Jabari Blash, Chris Marrero, and Peter O’Brien. Those gentlemen have combined for 141 HR in the MLB regular season and Harper has 121 of them. Neither Aguilar nor Marrero has ever gone deep in the big leagues. Only Harper and possibly Bird have any real chance of finishing the season among the league leaders. The logical hypothesis is that this list won’t tell us much about the season to come. There are three types of players on this list. The first type are players who get at least somewhat regular playing time and hit a decent amount of home runs. This includes Cano, Arenado, Pujols, Machado, and Trumbo. It also includes Story even though we didn’t know it at the time. There are 24 of such players–the majority of the group. Not everyone is a star though. The second category is players that barely played in the majors. Matt Chapman has yet to make his major league debut. Matt Davidson played only one game last year. There’s also another Peter O’Brien appearance! The third category is Jon Jay. Jay has 31 HR in 3043 PA for his career, yet somehow managed to hit five in spring training last year. Somewhere there is a poor soul who drafted Jay in a fantasy league expecting a breakout year. Instead he slugged .389 with 2 HR. 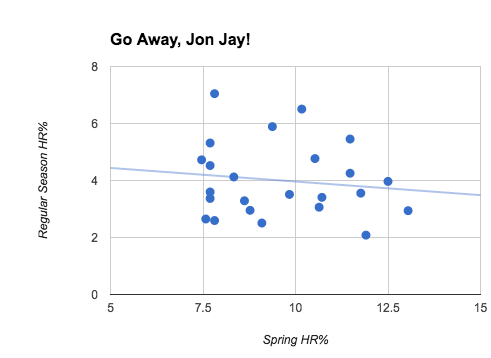 Spring training is a cruel and tantalizing beast and so is Jon Jay. All of them saw their HR% decline. If not for one more trip to the plate in the regular season, O’Brien would have mirrored his spring numbers exactly. Trumbo came close to his spring HR%; he also led MLB in HR. Some have good reasons for declining. Certainly Brandon Belt’s regular season home is less long ball-friendly than the Cactus league. Jon Jay became Jon Jay again because he’s Jon Jay. Without Jay, there is now a negative correlation of -0.131. In other words, among the 2016 spring training home run leaders, those who homered more often in March went deep less often in the regular season. This leads us to the preposterous conclusion that fewer home runs in spring training leads to more home runs in the regular season. What have we learned so far: NOTHING! Everything is meaningless and nothing matters whatsoever in the Grapefruit and Cactus Leagues. Home runs are dumb anyway. If you hit a baseball an arbitrary distance over an arbitrary fence you score an undetermined amount of runs depending on what your teammates did while you were possibly not even paying attention. Perhaps a lesson is still salvageable. 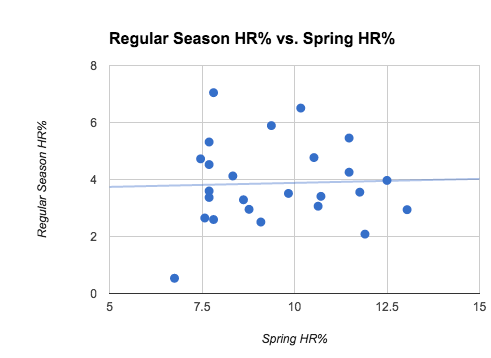 It appears that spring home runs cannot predict a better than average season compared to one’s peers. But can they can predict a better than average season compared to one’s self? The average 2016 regular season HR% for these 17 players was 3.93. Their average career HR% is 3.56. That may not seem like a big difference, but going deep 0.37% more often can only be a good thing. If we take out Jon Jay for reasons of being Jon Jay, the 2016 regular season HR% was 4.14 and career HR% is 3.71. These players hit home runs 0.43% more often than their career averages after a slugging spring training. Over a full season of 600 PA that would be an additional 2.56 home runs. Is it statistically significant? Probably not. Will this tell us anything about the 2017 season? Again, probably not. Most likely there’s nothing to see here and Peter O’Brien would probably agree. At the same time, every hitter in baseball would like 2.56 more home runs than they usually hit, especially Jesus Aguilar and Chris Marrero.